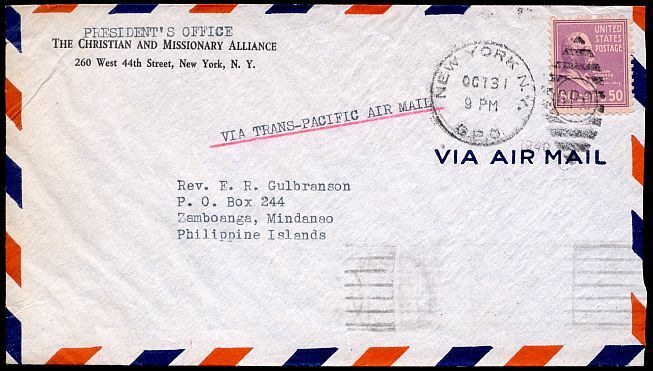 Airmail letters to and from the Philippines cost fifty cents per half ounce from April 21, 1937 until November 1, 1946, although service was suspended on December 8, 1941 and not resumed until August 14, 1945. This cover was sent to a missionary in Mindanao in October, 1940. This cover entered the mails in Manila in 1940, but was sent from the headquarters of the First Battalion of the 4th Marine Brigade in Shanghai, China. The cancel contains the motto "Semper Fidelis" between the bars. 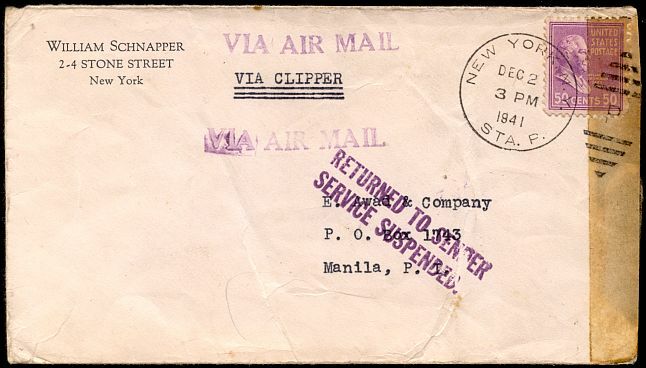 This cover was mailed December 2, 1941 and did not make it to Manila by December 8, when service was suspended. It was censored in Hawaii and returned to the sender.